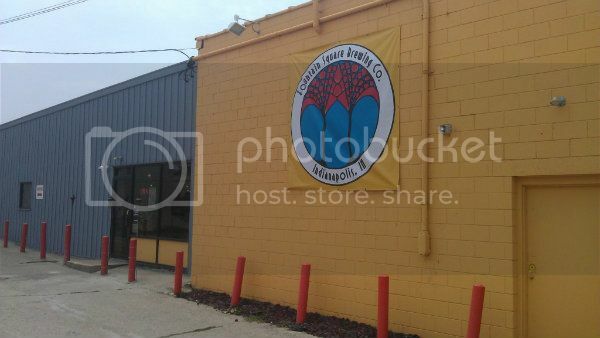 This place is about as far as you can get from my house and still be in Indianapolis, but I made a point of heading out to try out their goods. Their website said they were family friendly, so I took the kid with me. It's on a former military base, and this building is one of several just like it that have been converted to business use. Everything was nice and new on the inside. I took a quick peek at the menu and ordered their flight. Now I have to complain at least a little. #1, they claim that the sampler is 6 x 5 oz samples. Maybe if every glass was full to the rim, but what you get isn't close to 30 oz. #2, said sampler is $13, which is ridiculous. Either way, here's a shot of what was delivered. Fieldhouse Wheat - Crisp and refreshing, the Amarillo hops are a nice touch. Four Barrel Brown - Way too light and thin, no match for some of my favorite Brown Ales. Magnificent Amber - A hop-forward Amber is always welcome in my book. Flat12's is better, but still good. Deadeye Stout - Big roasty flavor without being too heavy, my second favorite of the group. Railsplitter IPA - An easy favorite, with a lot of citrus and floral scents and flavors. Very good. Sin Bin Belgian Pale Ale - A nice take on a Belgian pale. They have rotating food trucks on site to serve those looking for more sustenance than a pretzel can offer, and today's truck was Hoosier Fat Daddy. 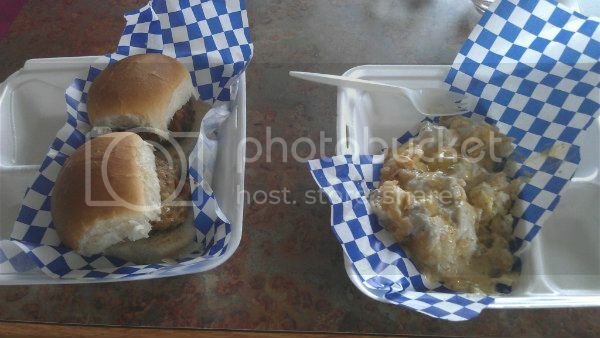 I ordered the meatloaf sliders and tater tot casserole, and both were awesome. I asked for samples of the other three beers they had available, and the guy brought me literally one sip of each. O’Rye-n Galaxy Pale - A nice pale ale with a subtle rye influence, and I always like Galaxy hops. I-65 Baltic Porter - I couldn't get much of a taste for this on the single mouthful I got of it, but it wasn't bad. B-Java I-65 Coffee Baltic Porter - The coffee in this was very good and fresh tasting. It was too hot for Baltic Porters, so I ordered a pint of the Galaxy Pale, and enjoyed it with my lunch. The beer was pretty good, but the inconvenience factor will keep me away. I can buy their beer in my local liquor store though, so I'll probably pick up some Railsplitter or Deadeye from time to time. I stopped by here after Black Acre on a Saturday afternoon outing. I had a hard time finding the place, but I think it's just because I'm stupid. I was looking on the wrong side of the street, so I missed the enormous sign. This location is an old car repair shop, and it's got a very cool and relaxed vibe inside. 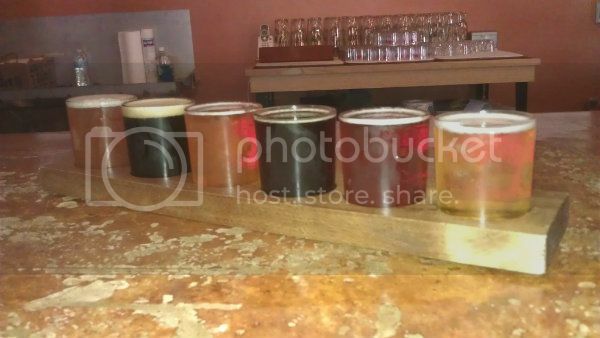 I took a seat at the bar and ordered their flight, which was six samples for $5. 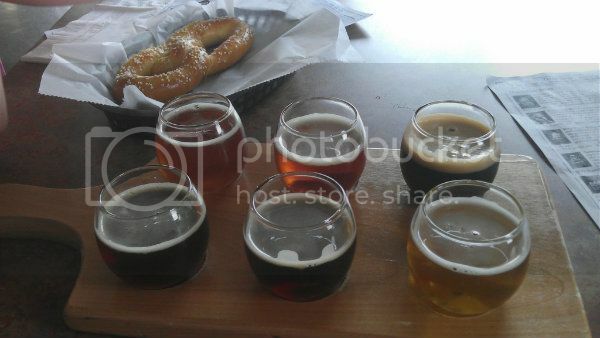 Just enough samples to try all of the four house beers and two seasonals that they had available. I started with the Workingman's Pilsner, which was light, crisp, and very refreshing. I got a bullet of that to go, and promptly drained it that evening. Next up was the Amber, which was decent for an Amber, but that's another style that doesn't do much for me. Up next was the Porter. I was riding high from Black Acre's Porter, and was looking forward to their take, but I was pretty underwhelmed at first. It was much thinner in body and color, but still tasty. As I kept sipping my sample, I didn't want it to end, so whatever was disappointing me at first was long gone by the end of the glass. I ended up ordering a bullet of it to go, also. I went for the Black Lager next, and it didn't taste like anything. I don't know if the beer was that mild, or getting bullied around by the Porter, but either way it's not something I'd try again. I had the Pale Ale after that, and it was a good hoppy Pale, but we have a bunch of hoppy Pales available around town now, and this wasn't remarkable. Last was the IPA, which was a solid take on the ubiquitous style. In talking to the bartender, they said they had two tanks that had just been delivered to help boost capacity, so they're flourishing as a company. They also have another new brewery opening a couple of blocks south of their location, so there will be more draw to the area shortly. 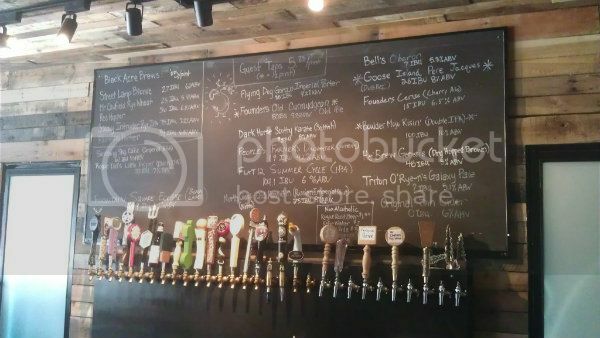 Good beer and a cozy facility, in a trendy area that's close to my office, makes this a guaranteed addition to my rotation, and their low keg prices ($45 to $70 per sixtel, depeding on style, at time of writing) will get them some time on the kegerator at home. I popped by here on a Saturday afternoon. They were putting in sidewalks in front of the place, so I had to use the rear entrance. I also forgot to take a picture of the outside of the place. Maybe next time. 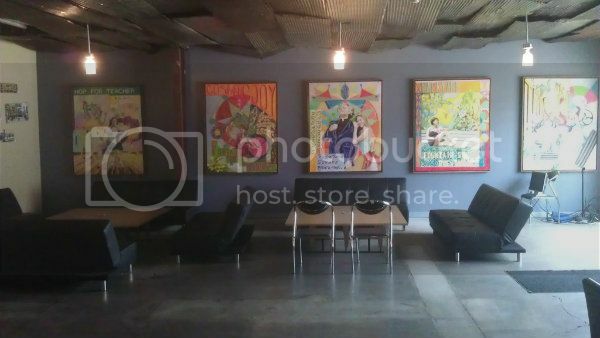 Either way, this is a very contemporary and cool location, but almost a little hipsterish. They had a killer tap list, that was very well balanced with several different styles available, from local, regional, and national breweries. I was here to drink their beer though, so that's what I ordered. 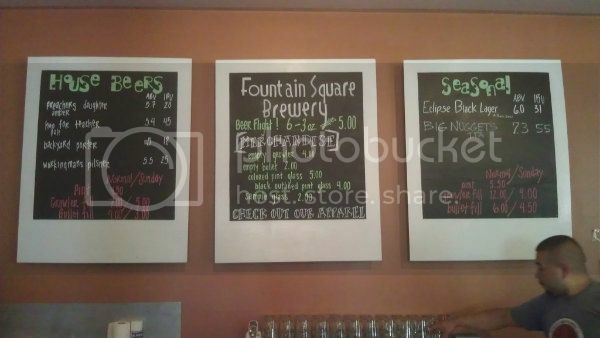 They had a 4-beer flight for $5, but they had five of their beers available. One of them being a Blonde made it easy to decide which one wasn't getting ordered. And here they are in all their glory! 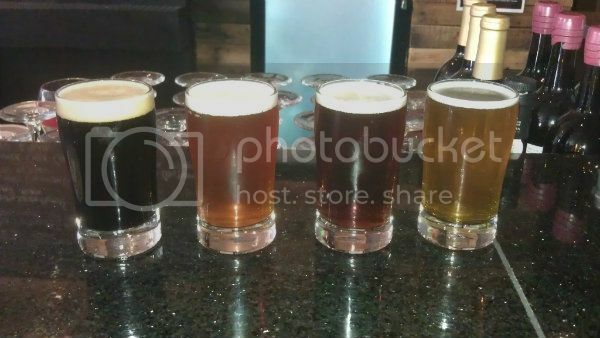 That's the Porter, Rye IPA, Red Hopper, and Rye Wheat. I started out with the Rye Wheat, and was surprised that I really liked it. In talking to the bartender, who is also one of the owner/brewers, he said that it was 40% rye, 40% wheat, and 20% specialty malts. It had the body of a Wheat, with the signature Rye spiciness, and the hops really rounded out the flavor. It's probably the best Wheat beer I've ever had, but it's not a style I really care for in the first place. I moved on to the Porter next, which had a nice roasty character to it, and a deep richness that kept me very interested. This is when my sandwich showed up, a BLT with Smoking Goose bacon and local bread ($9 with sweet potato fries), and it complimented the smoky bacon quite nicely. After that was the Red Hopper which was pretty unremarkable. I finished up with the Rye IPA, which I also enjoyed quite a bit. In talking to the bartender, he mentioned that they're having problems with their water supply, and they're working on addressing it. He said that because of how hard Indianapolis water is, they get a lot of hop harshness in beers. 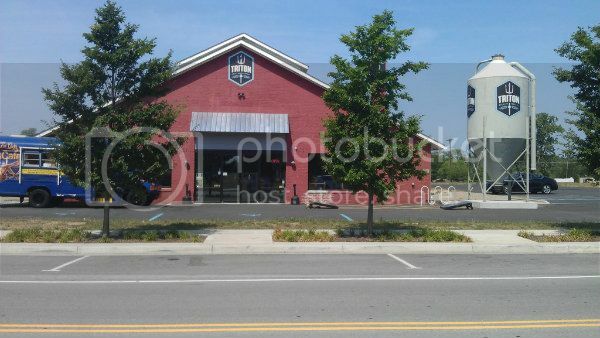 He also said that they're not selling growlers yet because they barely have enough beer to keep the doors open, and don't want to run out of their own beers. They have a green tea Pale Ale that wasn't on tap because they ran out. Overall, I'd say this is a quality stop with great house beer, a well thought out guest tap list, and a tasty sandwich to soak it all up. It's pretty far out of the way from my house, but I'll be back again for sure. 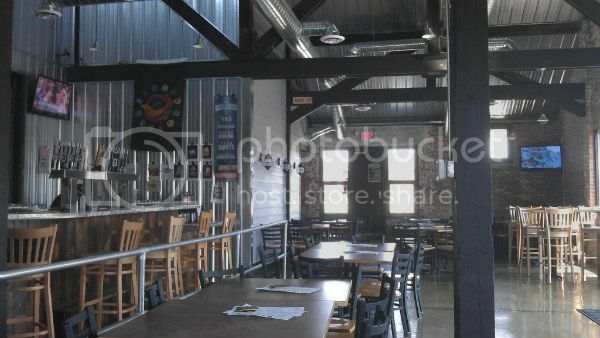 I am going to use this blog to list all of the available breweries and brewpubs in the greater Indianapolis area, and share notes about my visits. I'll split everyting up geographically, so you can tell which places are reasonably close to each other, and plan visits accordingly. Here's a Google Map of the city with all of the locations added.